I’m not going to talk about the plot of La jetée, or the eerie beauty of its composition. If you’ve never seen the film, I don’t want to give it away. I want you to approach it cold, as I did, some thirty seven years ago. Watching it again, I found my younger self. Selves. The twenty-year-old me was transported to Paris, where the fifteen-year-old me spent a lonely summer in 1972, living with a French family on a language immersion program. Images of Paris—its parks, museums, and grand boulevards—took me back to my own rather random wanderings about the city. Visits to the Tuileries Gardens, the Jeu de Paume, the sculpture garden of the Rodin Museum. The Sainte Chapelle, the jeweled light streaming through the stained glass windows of its upper chapel, a truly otherworldly experience. Mastering the Métro. Climbing the steps of the Eiffel Tower. Ordering a citron pressé at a café along the Boulevard St. Germain or grabbing a crêpe at a sidewalk kiosk. The fifteen-year-old me was captivated by Paris, which I was encountering without much of a context. I took it in without really knowing what I was seeing. One day I ducked into a movie theater to escape an unwelcome companion, one of the pesky boys who’d trail along after me on the street, inviting me to go dancing. The Gold Rush was showing: my first Charlie Chaplin film, and still my favorite. 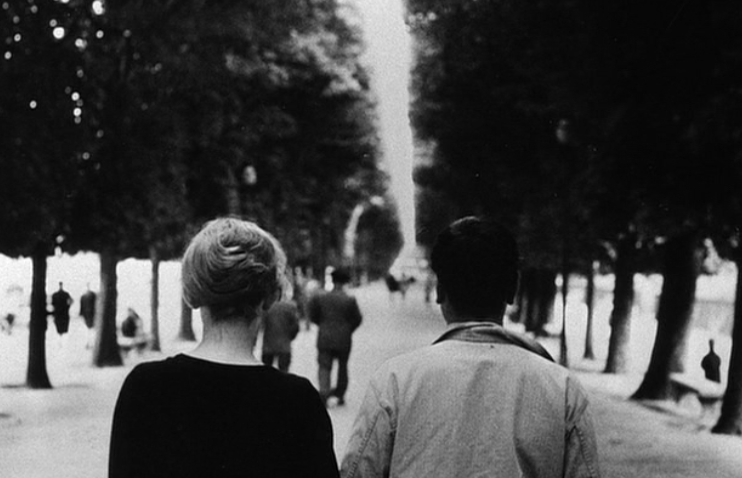 That Paris returned to me as I watched La jetée at twenty. I was already nostalgic for my earlier self, the girl who’d plunged fearlessly into her adventures in an unknown city, fumbling along in her inadequate French. But the hero’s nostalgia for the vanished Paris of his own childhood, a more innocent time, brought me back further still. The film is set in the aftermath of a nuclear war, a constant preoccupation in 1962, when the five-year-old me started school. It’s something of a joke now, the Duck and Cover drills. Practicing hiding under our desks in case of a nuclear attack. They used to have us practice sitting in the dark school corridors, too, away from the windows at the far end, or on the floor in the cafeteria. And one day we were sent home early, in some kind of emergency practice run. The school bus dropped us off blocks away from our usual stop, but our mothers were there, waiting to reassure us that we were safe. My parents were still talking about the Cuban Missile Crisis at Chanukah that year. I remember this because while they were distracted at the dinner table, arguing about Khrushchev and President Kennedy, I experimented with lighting a lollipop wrapper on one of the menorah candles and nearly set the dining room on fire. The wrapper was waxed paper and ignited in a flash. Whoosh! The flames singed my fingertips and I must have dropped the wrapper, because I remember my father’s quick action, stamping it out on the floor. Cascading memories, and a remarkable film that awakens them all. That’s an excellent way of responding in words to the film! Readers who haven’t seen it…well, they just should, for the sake of the experience as well as for grasping why you’ve approached it this way. In truth, though, many of our experiences land on a spiderweb of memory, and bringing one back returns others as well. Oddly, not everyone connects films with other parts of their life, or something varies in how it happens. A close friend of mine who sees more films than I do will often ask whether I’ve seen something—Juno, say. I’ll tell him, “Yes, I saw it with you, [in such-and-such fancy mall in Dallas,] when it came out in December that year. After it, we disagreed about romance while we drove to have dinner at [an old haunt of ours].” He, though, like many others, will recall lines of dialogue or the exact succession of the plot development better than I do. An Italian writer I once found quoted in a Times article said more or less, “Memory is not a record of what happened. It is itself something that happens.” A bit relativist for me, but it certainly explains the differences in how things are recalled. It may even account for Rashomon, but that’s another subject. many of our experiences land on a spiderweb of memory, and bringing one back returns others as well. La Jetée made such a powerful impression on me at age 20 that I still remember the experience at age 57, so watching it again left me with rather melancholy feelings. Glad you appreciated this very subjective response. I’m a great fan of both this (which I’ve gone too long without seeing–watched Le Statues Meurent Aussi last evening, also highly recommendable) and the feature length ‘remake’ (with a biological catastrophe replacing the nuclear one) Twelve Monkeys. I like this approach, though I wonder if you couldn’t have opened a couple more flashback windows to simulate the slightly vertiginous sense of time shuttling back and forth in La Jetee. It’s true. I haven’t fully done justice to the complexity of Marker’s film. My own memories seem rather trite, when put up against the themes of La Jetée. The fact that the whispering of the authority figures is in German, for example, evoking Marker’s childhood during the Occupation. Hard to match that with Duck and Cover drills or even the Cuban Missile Crisis.